Music marketing is essentially the intersection of music and marketing – that much should be obvious. But here’s an analogy that will further clarify how it works and why it’s necessary. When a business launches a new product, it needs to promote that product. Even if the product itself is amazing, and it serves an audience, if no one knows about it, the business serves no one and makes no money. Music is very much the same way in that even after it’s been distributed, it still needs to be promoted. But it’s also different from launching a product in that you can’t create a need for music (more on that later). What’s the Difference Between Music Marketing & Music Promotion? These two terms have become synonymous, and are more or less interchangeable. From my perspective, music marketing is a more formal term. Practically every company has a marketing department or a marketing person, and if not, they collaborate with a marketing agency to further their business objectives. When people look for marketing positions in the music industry, they search for “music marketing jobs”. I know this, because I see it pop up as a keyword all the time. That will be a subject for a future blog post. But as commonplace as the word “marketing” has become, musicians don’t necessarily know what it means (until they start reading one of the many music marketing blogs that are out there). Thus the term “music promotion”. Most people immediately know what promotion means. Does it go deeper than that? Perhaps so. I would love to hear your thoughts in the comments section below. Musicians are often on the bleeding edge of technology and marketing practices, sometimes without even knowing it. They blaze a trail first and look back later. Many entrepreneurs and businesses get to learn from what went wrong with the musician’s marketing practices, and improve upon the strategy to apply it to their own business. Fundamentally, music is promoted in much the same way anything else is – with online methods like email, social media, advertising, and with offline methods like live events (concerts and tours) and word-of-mouth. But again, there is a difference between promoting music and a product that people have an immediate need for. People don’t have an immediate or ongoing need for music. Music is powerful in ways commonplace products (like shampoo or toothpaste) are not, because it evokes an emotional response. But there is more music available than people could ever listen to. Musicians can create demand for their music. As they become more known and more popular, more venues and event planners are going to want to book them. They can also do something novel, something charitable, something valuable (on a large scale) to get noticed. More bloggers and media people are going to want to interview and profile them. More people are going to want to listen to their music and go to live shows because of social proof. But although you might need clothes to stay warm and fashionable, you don’t really need music in the same way. It’s not a matter of personal hygiene or appearance. It’s not a pressing problem that needs to be solved. It’s not a matter of survival. That’s the true challenge of marketing music. In the last 10 to 20 years, most CD/music stores have all but gone the way of the dinosaur. There are still some out there, and a lot of independents have survived thanks to the resurgence of vinyl records. But fewer and fewer people are buying music in CD form any more. When CDs, tapes, and physical media was still popular, music was distributed to brick-and-mortar music stores where it would be cataloged and sold to walk-in customers. Today, physical distribution is too costly and limited in scope to be worthwhile. Digital distribution is the new standard. Digital distribution services like CD Baby, TuneCore, and Ditto Music allow any musician (independent or major) to get their music out to popular online music stores and streaming sites like iTunes, Spotify, TIDAL, Pandora, Google Play, and so on. Music distribution is necessary, but unfortunately, it can’t be equated with promotion, unless a song is featured in a playlist, is given prominent placement in an online marketplace, or the song/album ranks in a chart (iTunes Chart, etc.). 4 Music Marketing Ideas I’ve Tried That Didn’t Work: in this post, I detail some of the mistakes I’ve made and some of the ways in which I’ve failed with my music marketing efforts. What You Ought to Know About Setting Your Music Marketing Goals: this post details the many steps musicians often don’t take when they’re looking to market their music. 7 Things You Must Know About Music Marketing Online: things every musician should be aware of as they look to promote their music online. 10 Music Marketing Basics You Need to be Aware of: this post details the basics of music marketing, both online and off. 7 Steps You Can Take to Build a Successful Music Marketing Campaign: it’s easy to miss important steps in building a marketing campaign that gets results. If you want to do it right, read this post. How to Create Your Own Music Marketing Blueprint: this post explains how to boil all of your music career goals down into a single living document. 10 Music Marketing Ideas for You to Try: I did my best to share some outside-the-box music promotion ideas in this post. How Has Music Marketing Changed in the Internet Age? : the internet has changed the way a lot of things are done in business and music. Find out what’s different now that the internet is becoming ubiquitous. 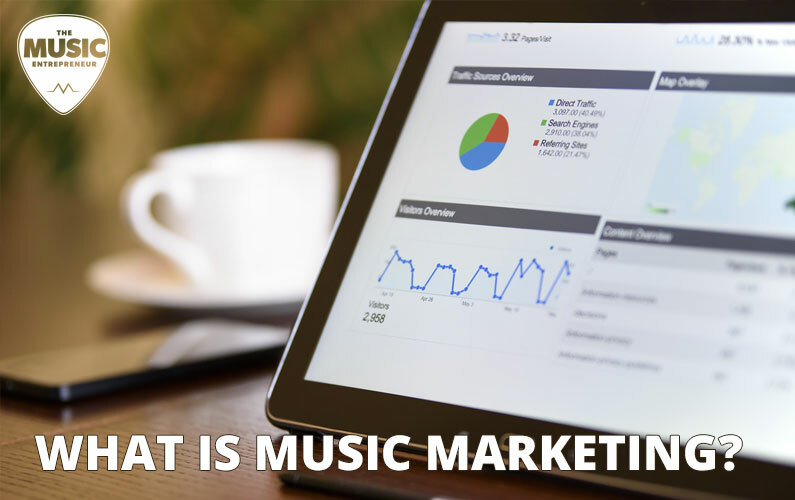 Do you now understand what music marketing is? Do you feel like you could explain it to your friend in a single sentence? If not, I haven’t done my job. I would love to hear your thoughts. Please leave a comment below, and explain what music marketing means to you, for the benefit of everyone involved.